Herb Kohl leads a trio of potential Republican foes for reelection in 2012 and if he steps aside outgoing Senator Russ Feingold leads all of them too. Kohl would begin in a pretty solid position if he did decide to seek reelection. 50% of voters approve of the job he's doing to 35% who disapprove. Most striking are his strong numbers with independents, 51% of whom approve of him to only 32% disapproving. That's good news for Kohl shortly after an election season where those voters gravitated toward Republican candidates. Kohl's numbers with partisan identifiers are pretty predictable- Democrats pretty universally approve of him (80%) and Republicans for the most part disapprove of him (66%). Kohl leads hypothetical 2012 contests against Congressman Paul Ryan, former Governor Tommy Thompson, and Attorney General JB Van Hollen by margins ranging from 6 to 13 points. Ryan does the best, trailing only 48-42. Thompson faces a 49-40 deficit, perhaps another reminder that Republicans were better off this year with a fresh face in Ron Johnson than they would have been with trotting Thompson back out there. Van Hollen trails 51-38. Although Kohl's leads are largely attributable to his popularity, part of it can probably be chocked up to the Republicans other than Thompson being relatively unknown. 33% of voters in the state don't know enough about Ryan to have formed an opinion of him- among those who do have one 38% see him favorably and 30% unfavorably. Van Hollen is even less well known- 39% have no opinion about him with those who do breaking down 32% positive to 29% negative. What might be most interesting in this poll is how Russ Feingold does as a possible alternative should Kohl retire. His approval rating is 50% with 43% of voters disapproving of him. Those numbers might seem amazing barely a month after he was defeated for reelection but it's a reminder just how different the midterm electorate was from the state's voters as a whole. Republicans were much more energized to go to the polls than Democrats this year and because of that Feingold lost but his popularity with Wisconsin voters overall is not too bad. Feingold polls similarly to Kohl in head to head match ups against the Republicans, leading Ryan by 7 points, Thompson by 9 points, and Van Hollen by 11 points. Despite his setback this year it looks like he could potentially be a formidable candidate again in the future. 2012 is a long ways off but at this early point it looks like Wisconsin's Republican swing in 2010 may have been more of a blip than a signal of an emerging trend. You had Feingold -11 with independents two months ago at 41/52 and he lost them 43/56. You now have him +15, at 54-39. Did Feingold suddenly become more popular or are these independents who didn't vote a month ago? That was using a likely voter screen, and he did mention that the 2010 voters were dramatically more Republican than state voters as a whole. It would not be at all surprising for the 'independents' to have a distinctly different composition in a poll of statewide voters instead. The LV model skewed heavily conservative last year, so it's not surprising that Feingold's favorables are better here. This depresses me, with better turnout Feingold could've won. Ugh. No, it's a different sample. 2010 likely voters vs. 2012 registered voters. To draw a line and say Feingold is more popular now than he was a month ago doesn't work. Surely many people get so shoked after the results of November, ad now take a more active role. This can affect to the result of the poll. Ahem no; I think PPP is back to it's cheerleading self, with the 2010 election behind them and the 2012 election 2 years away. After showing reasonable numbers coming into the election, their numbers are now way favorable to Dems, as if they drank a few gallons of the DailyKOS Koolaid when the 2010 election ended. I think what is going on is this: Since PPP doesn't have to deal with an election for another 2 years, they feel free to show their usual Dem slant to all the elections. AS we get closer to 2012, I trust they will get closer to reality of risk coming across as too much a chearleader for Dems with hokie numbers. All of a sudden Barack Obama is killing all his REpub comptetitiion, and all the Dem Senators are winning by sizable margins in states that Repubs just won handily - even as other polls show Obama at all time lows. Something doesn't smell right with the PPP polls since the election. Caution is in order until other polls confirm these results. Wasn't Feingold faring about this well against Johnson few months ago? He went on to lose the election. "Did Feingold suddenly become more popular or are these independents who didn't vote a month ago?" The latter, most likely. Those who claimed to be independents and voted last month were not all just swinging wildly from election to election. Those independents were more conservative than the independents who show up in presidential years. No questions about the "high speed" rail project? Recall the PPP headline from November 24, 2009: "Feingold Looks Solid." 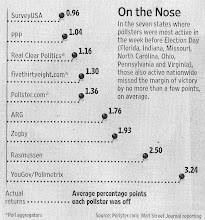 At that time, PPP showed Feingold leading his GOP competitors by anywhere from 9-15 points. Then out of nowhere came Ron Johnson. "All of a sudden Barack Obama is killing all his REpub comptetitiion, and all the Dem Senators are winning by sizable margins in states that Repubs just won handil"
Actually, no, Obama is not killing in Ohio or Montana or North Carolina (though doing about as well as he did in 2008 there, depending on the opponent). And Claire McCaskill is not doing well, and we'll have numbers out tomorrow on Sherrod Brown that may dispel your views. We shouted from the rooftops during the 2010 election about the enthusiasm gap explaining a huge portion of the outcome, and now that we have a different electorate, a wider one that's more appropriate for a higher-turnout election like a presidential, Democrats are naturally doing better. "No questions about the "high speed" rail project?" No, that's not exactly a hot-button issue outside those states. Call me skeptical. A month ago your poll of 2010 likely voters was 18% liberal/41% moderate/40% conservative. This poll was 19% liberal/41% moderate/40% conservative. This poll had 35% Democrats, while the other one had 30% Democrats. This poll had 31% Republicans, while the other one had 34%. For you to come up with the same % of conservatives with less Republicans indicates this sample of independents is more conservative than that one. So your poll says that with more conservative independents in your sample Feingold does dramatically better. So your explanation doesn't hold water. @Smooth Jazz that sounds a lot like what people used to say about Rasmussen.